A song inspired by the savage beating of a stray dog called Triton rescued by Kimba Refuge in Spain in 2007. Although the lyrics are not connected, the distress we felt after reading the horror of Triton's injuries gave way to despair about the world we live in today and the fact that there is too little protection for animals and a lack of political determination to bring forth tougher sentences for those who are violent towards sentient beings. If you read on you will see the update from the rescue volunteers. Triton was saved and he went on to recover from his injuries and he also found a loving forever home and he now enjoys his peaceful days with his family and his companion dog friend Krisna. Well done to everyone who helped to save Triton and who enabled this sweet stray dog to put the sadness of his past behind him. Is there only evil in this rotten cruel world? Is it bad enough to do some good? Is it good enough to make you pray? Will the seas and forests lose their nature in the breeze? Is it good enough to learn to die? There are those who think that as animal protection societies we are accustomed to all types of abuse, but there are dispicable people who continuously demonstrate to us just how far abuse can go by a useless sadist (in the broadest sense of the word), who aims all of his cruelty toward defenseless and weak beings. His cowardice would never allow him to become aggressive with a species that could defend itself. 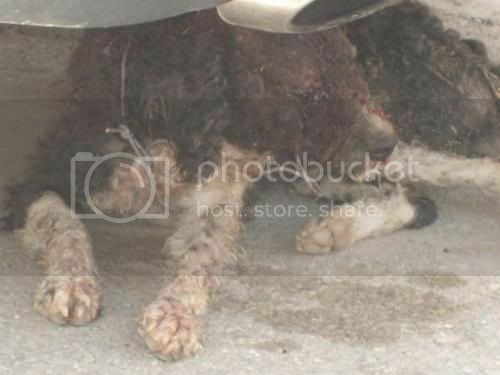 Recently a poor little abandoned dog had the misfortune to cross the dirty path of someone in the village of "El CUERVO" (Sevilla). "Tritón" is the name that we've given to this good little dog who was abandoned like many others in the above mentioned village. A nice young woman had been feeding him, along with a group of abandoned dogs in the village. And one day when she went out to feed them as usual, she found him in this lamentable condition. Some dangerous halfwit from this village had tied him up with wire and then beat him nearly to death. Thanks to Sandra, this dear little boy, Tritón, is now at Kimba. He has bruises all over his little body, two open wounds on his head, and he lost one of his pretty eyes, due to the beating from that degenerate which punctured the iris. Tritón has lost a lot of blood and is very anemic. Our veterinarian told us that he will operate on the eye as soon as possible, but first the dog will need to recover a bit, as he would not be able to tolerate the anesthesia in his present condition. At Kimba we are doing everything possible to nurse Tritón back to health, and the prospects are in his favor. As you can see he is looking better. 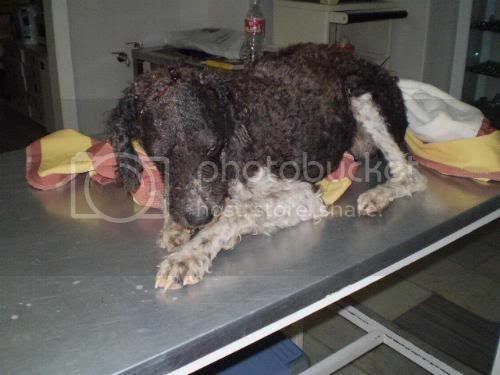 We have bathed him and we are hoping that next Thursday our veterinarian will operate on his eye. One more abuse added to the endless arbitrary sufferings inflicted upon small beings by worthless individuals who without doubt will sooner or later begin to attack women and children. And if only for the possibility of that happening, the people of that village should investigate the atrocity that took place in their town. We are very certain that someone must have heard this poor animal crying. But, of course, he is merely a ragged dog in EL CUERVO, a "beautiful and cultured" Andalusian village. Triton is found battered, he has lost an eye from the ferocity of the beating. Triton is now safe at Kimba Refuge but his care will cost a lot of money in the weeks ahead. you may remember our song 'Is it bad enough for you?' inspired by a sweet little Spanish dog named Triton who was badly beaten and taken into the care of Kimba Refuge, Spain. We followed his story as the shelter staff gained his trust and tended to his injuries and in time Triton was lucky enough to find his forever home. Today Kimba refuge sent a letter from Triton to his well wishers and some new photographs, hope you enjoy these as much as we did. Triton's song was nominated for a Golden Kayak Award 2008 at the Independent Artist Company in rock category. Juliette & the Licks won the award with their song 'Inside the Cage' but we were thrilled that Triton's song & story were given a higher profile as part of the online event. We'd like to thank the staff of Kimba Refuge and Triton's new family, for making this terrible tragedy into a happy ending. You have our greatest respect and support. We have received a lovely letter and some photos which we became very excited over, and we wanted to share them with all of you. Do you remember Triton? The poor little dog who was so badly beaten in a village in the province of Sevilla... Well, After all of his suffering, he is now beautiful and happy thanks to the wonderful life that he now has with his family. And this is the lovely letter that touched the hearts of all of us who knew him. 'Hello my friends at Kimba! I'm writing to you to let you know that I'm doing very well. I love my home; I like my friend Krisna, who is an Alaskan Malamute with whom I live, and although she always wants to be the first one to eat and to finish it all, she runs with me and she likes to play ball, just as I do. And I really enjoy going for walks in the mountains with the humans who took me in, because up there I can show them what a good sheep dog I am, and that even though I lost one of my eyes, I am very happy and I can run, tire out and play. I send a big lick to all of you who took care of me. I will always owe my life to you. Maria Daines - Is It Bad Enough For You?